well a blog about miniature wargaming without pictures is not a blog! So I believe that the time for pictures has come! 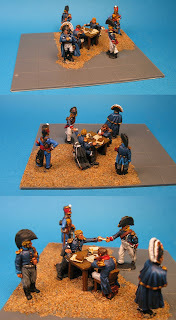 Quick note: units are based liberally (especially artillery and commanders) but I have tried to use the base sizes used in the General De Brigade rule system. One day I would like to give it a try. 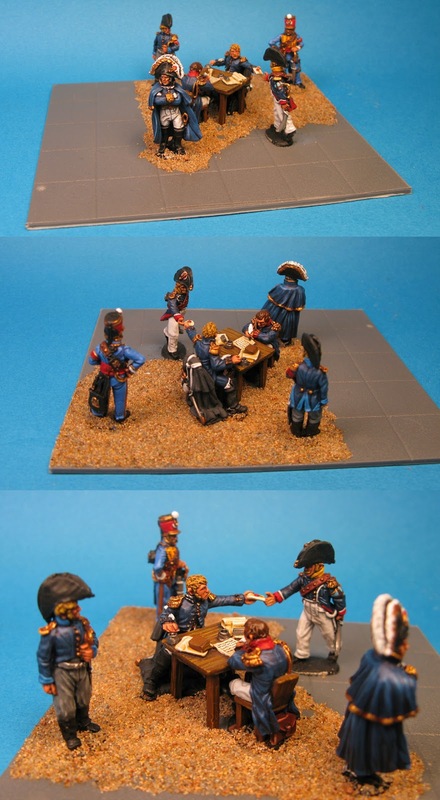 For the time in our small yet loyal Napoleonic group we are using "Black Powder" by Warlord games. General de Division Achille Talon! All minis are Perrys. The base is from GW's custom movement tray. Let us proceed now to General de Brigade Alexandre ChargeBeaucoup! And now, to the troops! Again, these are plastic Perry minis. Those look fantastic, Achilleas- I just love the command stand. I'm really look forward to seeing them in January's game. Vive l'empereur!!! Yip, agree with Robert, your figures are the business. You will be inspiring Robert to get stuck into more of his Russians. Look forward to seeing both your armies grow! nice compact units, I like the very clean and smooth painting. Really good looking army! Can't wait to see more.